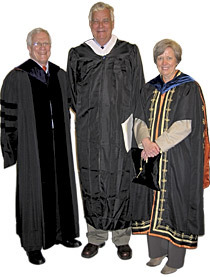 Dean of Admission Fred Hargadon (center) prepares for the Baccalaureate ceremony with Robert Rawson Jr. (left), chair of the Board of Trustees executive committee, and President Shirley M. Tilghman. 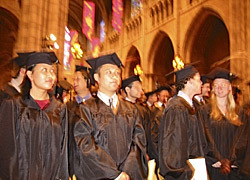 The man who admitted Princeton's now-departing seniors advised members of the class of 2003 to view graduation as their entrance into a lifetime of learning in remarks at the University's Baccalaureate service on Sunday, June 1. Photographs from Saturday's P-rade are available online. 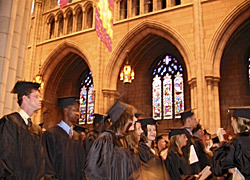 The Bacalaureate Service Webcast is archived in WebMedia. 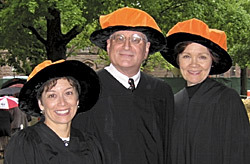 Dean of Admission Fred Hargadon marked the beginning of this year's Commencement-related activities, as well as his own retirement after 15 years at Princeton, with an address that mixed heartfelt, paternal sentiment and his typical humor. While a Princeton diploma recognizes the accomplishment of completing a demanding undergraduate program, "by no means is it meant to certify that you are now a completely educated person," Hargadon told the seniors. "Rather you should consider it as hard-earned evidence that Princeton now believes that you will be well prepared to continue to educate yourselves for decades to come." "If you are wise," he added, "you will use what you have learned here and parlay it into additional educational returns many, many times over in the years ahead." 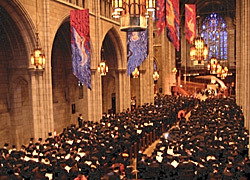 The Baccalaureate service is one of the University's oldest traditions, with its beginnings in 1760. It involves seniors and their families, and includes prayers and readings from various religious and philosophical traditions. In preparing to deliver the address, Hargadon had considered a simple way to convey his mixed feelings of pride and sadness in seeing the seniors graduate. "I did play around with the idea of simply standing up, telling you 'don't go!' and then sitting down," he said. "It would have been a landmark Baccalaureate talk." In her introductory remarks, President Shirley M. Tilghman noted that "Dean Fred, as he has become known to the over 17,500 Princetonians that he has admitted, has left his indelible mark on Princeton and shaped the world's image of a Princetonian." Hargadon added that when he asked Tilghman's advice before delivering his address, "she told me just to share my accumulated wisdom with you. I found that momentarily flattering, but you'll be relieved to know that I later figured out that was her polite way of telling me to be brief." Hargadon has long been a national leader in the field of college admissions -- known for the personal attention he pays to each application, his trademark "YES!" letters of acceptance and his active engagement in campus life. He came to Princeton from Stanford University, where he was dean of admission from 1969 to 1984. He held the same position at Swarthmore College from 1964 to 1969. Hargadon told the seniors that the University's unofficial motto of "Princeton in the nation's service and the service of all nations" should be translated as "using what you know and the resources at your disposal in as public-spirited a manner and as generously as possible on behalf of others -- in other words, to be a good citizen in the broadest sense of that term. That, I would like to think, is the special message written in invisible ink on a Princeton diploma." He sent the graduates off with a vote of confidence about the positive impact he expects they will make in the world. "I'm not able to mark your graduation by offering a plan to bringing peace in the Middle East, nor a cure for SARS or the ravages of AIDS in Africa. What I can say is that I am banking on there being some among you, the members of the class of '03, who will at one point or another in your lives be able to return to Princeton having contributed to the solutions of these and other problems that beset the world," Hargadon said. Reflecting on his own time at Princeton, he added: "Deep in my heart, I wish for each of you a life as interesting and rewarding as you have managed to make mine. You have a long way to go and more time to get there than you now realize."